Fans of The Beatles’ Sgt. 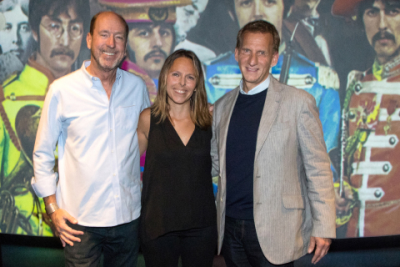 Pepper’s Lonely Hearts Club Band will be able to experience the album during these one day special events in Dolby Atmos, a state-of-the-art sound technology that places and moves sound all around the audience, including overhead, to truly immerse the audience in the music. The Dolby Atmos mix has been created by Grammy Award-winning producers Giles Martin, the son of George Martin, The Beatles’ original producer, and Abbey Road Studios senior engineer Sam Okell in collaboration with Academy Award-winning re-recording mixer Chris Jenkins. “This is one of the most important albums of all time,” said Giles Martin. “Each track has its own character and imagery, building song by song across the record as a whole. The Dolby Atmos mix is truly immersive, placing the audience inside the recordings like never before." Fans will be able to enjoy hearing Sgt. Pepper’s Lonely Hearts Club Band at listening events today on the album’s 50thanniversary will be held at the following locations. For tickets and showtimes visit this link. Universal Music Group (UMG) is the world leader in music-based entertainment, with a broad array of businesses engaged in recorded music, music publishing, merchandising and audiovisual content in more than 60 countries. Featuring the most comprehensive catalog of recordings and songs across every musical genre, UMG identifies and develops artists and produces and distributes the most critically acclaimed and commercially successful music in the world. Committed to artistry, innovation and entrepreneurship, UMG fosters the development of services, platforms and business models in order to broaden artistic and commercial opportunities for our artists and create new experiences for fans. Universal Music Group is a Vivendi company. Find out more at: http://www.universalmusic.com. Dolby Atmos delivers moving audio — sound that can be precisely placed and moved anywhere in three-dimensional space, including overhead. It brings entertainment alive all around the audience in a powerfully immersive and emotive experience. To learn more about Dolby Atmos, visit www.dolby.com/Atmos.